The Custard TV: US Broadchurch remake comes to ITV Encore. US Broadchurch remake comes to ITV Encore. Not quite had enough of Broadchurch? Well, you're in luck as ITV has announced that pay channel ITV Encore will be showing the US remake Gracepoint which aired on Fox last year next month. The 10-part series, which sees David Tennant reprise his role as lead investigator accompanied by a severely dodgy American accent, failed to garner much attention from viewers or US critics. The series also stars Breaking Bad's Anna Gunn in the role made famous by Olivia Colman. 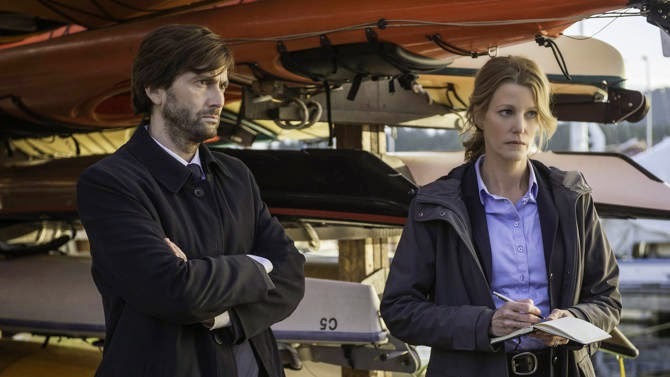 Sasha Breslau, Head of Acquired Series, ITV said; 'We're extremely pleased to give our viewers the chance to enjoy Gracepoint, an adaptation with such rich associations, but which stands on its own as a compelling, distinctive piece of drama'. Why?? I can't image anyone in the UK would want to watch this version. As an American I was bewildered when FOX aired this knockoff after BBC America already aired the far superior UK version. What a waste of ITV money. This is truly awful and I mean miles miles worse than the travesty that was Broadchurch 2 awful. I thought ITV would want to bury this somewhere as it was a giant flop in the US (one of Fox's most costly failures) and the reaction from the US media was even more murderous than that which BC 2 got here. Surprised that this has resurfaced on ITV not cable wasteland. David Tennant is a complete embarrassment in this with one of the worst accents ever put onto the screen and even Anna Gunn puts in a flat performance in the Ellie role. Not her fault as Tennant sleep walks through the entire thing. This was only made to try to give Tennant another leg up in the US market (his casting came as part of the package for FOX to take this project from Kudos). Even Chibnall cut this loose early on. Good for some laughs at David Tennant's expense and Nick Nolte (when you can understand him) is pretty good in the Jack part and the Beth actress is passable, everything else is woefully bad and screams 'made for the pay cheque'only.